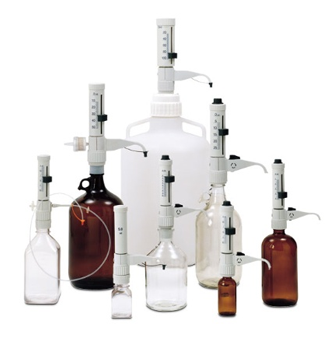 Brinkmann bottletop dispensers and ChemSaver dispensers offer you unique and useful features for reliable and convenient reagent dispensing. They are ideal for dispensing aliquots of liquid from large supply bottles - extracting reproducible dispensing volumes without reagent waste. They also ensure the best possible protection for you and your laboratory when working with caustic liquids such as solvents. For the utmost in safety, they feature extremely high chemical resistance and can be autoclaved. Every dispenser is supplied with three adapters. A wide range of adapters and accessories are available to expand your applications. The ChemSaver’s recirculating safety valve channels reagent back into the bottle during priming-eliminating the waste that typically results from preparing the dispenser for use. ChemSaver models also feature finer volume adjustments for working with viscous and/or high-density solutions.